This limited edition set is ready to ship! Our Canada Post shipping deadline for holiday arrival (Canada / USA) is December 8th. Our Vintage Holiday Colourway Set for 2017 features three new special edition colourways inspired by the coming season. You will receive 3 skeins of our Super Sweet Sock yarn, one of each special edition colourway listed below. If you would like to add some extra gifts to your order, be sure to check out our current selection of Gifts & Notions. 1 x Merry & Bright - A rich blend of red and pink. 1 x Wonderland - A magical blend of pink, purple, teal and blue, with a dash of grey. 1 x Tinsel Tree - A subtle blend of light grey, soft pink and mint. 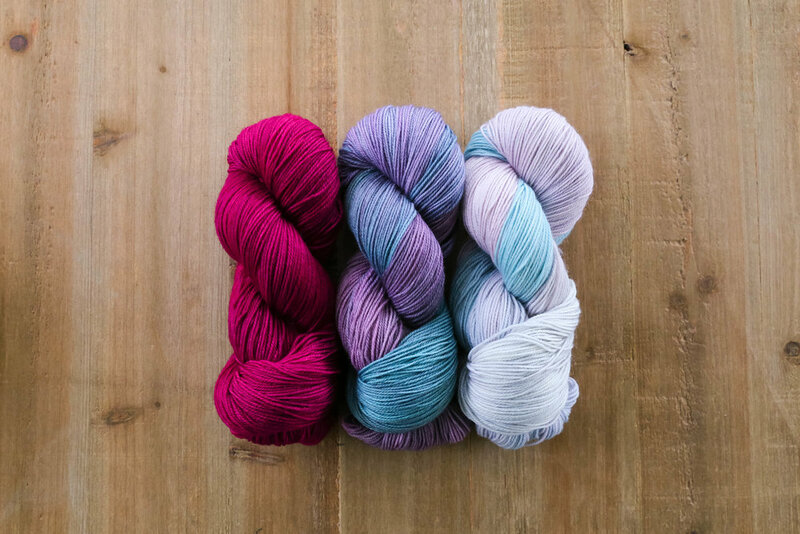 Each skein is unique and may vary slightly from those pictured due to the hand dyed process and how each batch blends together. Colourways are not available individually at this time and stock is limited. Super Sweet Sock - Tried and true, this made to last sock yarn is one of our favourites! Made with a blend of superwash merino and nylon this sock yarn will keep up with the wear and tear of everyday life.